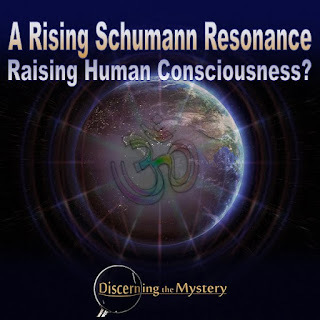 Discerning the Mystery: A Rising Schumann Resonance Raising Human Consciousness? The Schumann resonance is the resonant frequency of the Earth's electro-magnetic field. It is also known to be foundational to human consciousness. For the technical definition, we turn to Wikipedia. 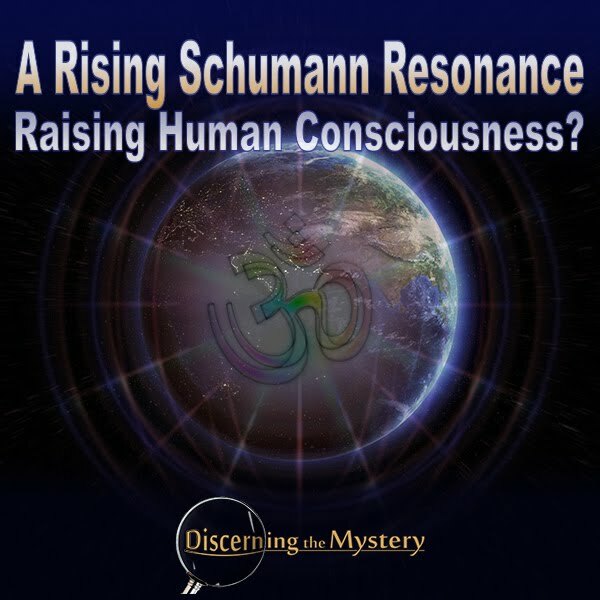 “The Schumann resonances (SR) are a set of spectrum peaks in the extremely low frequency (ELF) portion of the Earth's electromagnetic field spectrum. Schumann resonances are global electromagnetic resonances, generated and excited by lightning discharges in the cavity formed by the Earth's surface and the ionosphere. So we learn here that the Schumann resonance is not simply one frequency, but a series of frequencies within a singular wave form. It is this frequency that is found to be rising sporadically from 7.83 Hz (the strongest of the series) to a frequency as high as 16.5 Hz. The Event Chronicle had this to say on the matter. “For many years this resonance frequency has hovered at a steady 7.83 Hz with only slight variations. In June 2014 that apparently changed. Monitors at the Russian Space Observing System showed a sudden spike in activity to around 8.5 Hz. This change in Schumann frequency could very possibly, represent a change in human consciousness, but what does this mean, and if this is true, how could we measure such a change? There is, in fact a procedure for measuring various levels of human consciousness. This technique is known as “electroencephalography”. Wikipedia had this to say about this procedure. We learn here that different levels of consciousness correspond to various frequency ranges in Hz. For greater definition, the table below helps us map out these various brainwave frequencies. So far we have described how to measure the Schumann resonance, and we've defined the means to measure brainwave frequencies which correspond to various states of consciousness. We know that the Earth's electro-magnetic frequency is rising, but what does all of this mean, and how does this relate to practical life? The Event Chronicle gives an interesting picture of what this change of brainwave frequency might look like. "A 7.83 Hz frequency is an alpha/theta state. Relaxed, yet dreamy—sort of a neutral idling state waiting for something to happen. A 8.5 – 16.5 Hz frequency moves one out of the theta range into more of a full calmer alpha state with faster more alert beta frequencies starting to appear. We can see that this Schumann resonance, to whatever extent, is increasing. With this in mind, the question becomes, will this culminate into an "awakening" of sorts, and an opportunity to raise our individual, and collective consciousness as a species? My sources point to "yes", and the results, I believe, will astound us all. For information on the collective effects of group meditation, click the link below. Excellent article, particularly in view of what is currently transpiring. Thank you!